Following on from last year's success, the Nottinghamshire branch of the British Science Association again put on a series of talks at Science in the Park 2017, held at Wollaton Hall. Professor Peter Mitchell from the University of Nottingham gives a talk on "Our eyes deceive us: visual illusions reveal that the world is different from what we think". @Gav Squires was there and has kindly written this guest post summarising the event, with some linkage added by NSB. How do we mis-perceive that world? The was that we see the world is inaccurate and this is demonstrated in the drawings that we produce of it. However, some people do see the world in a more accurate way and they are able to better represent what's actually there. Drawing has always been a core human activity. 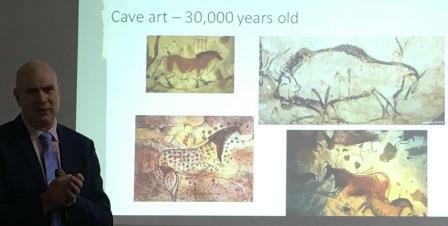 Even as far back as 30,000 years ago, humans were producing art on the walls of caves. Their knowledge of the world influence what they drew. By the Renaissance, artists had learned the laws of perspective by creating an invisible eye line. This enabled the three dimensional world to be represent on a two dimensional surface. The way that we draw the world is influence by the way that we see the world. When drawing something that we've seen in a photograph, we are guilty of "boundary extension" - putting in details that are outside the frame of the photo. We extrapolate from what we've actually seen. Is this because we want to draw complete object? No, even in the case where there are no cropped items in the photograph, we will still extend the boundary. This is because of our inherent knowledge of the world - we know that there is more than just what is in the photograph. Despite the invention of perspective, we have difficulty depicting three dimensions. For example, if we are drawing an object from a photograph that we know have 90 degree angles, then we will depict them as such even if they don't appear to be 90 degrees in the photograph. Our knowledge is contaminating our perception. Even someone like Raphael was guilty of this. We default to our knowledge. What about the drawings of children? These tend to focus on what children find important so when they are drawing a car, they will make a big deal of the boot as that's where they put their toys on journeys, for example. 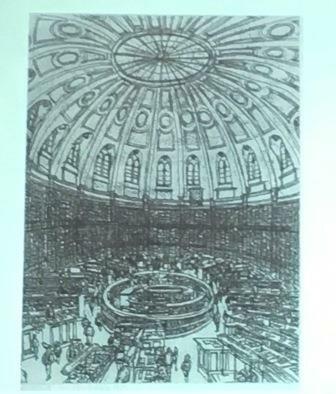 However, there is an example of a schoolchild of 11 drawing the reading room at the British Library. He only looked at the scene for ten minutes and took neither notes nor sketches but drew the whole thing from memory. He had autism, which explains why he could see the world more accurately and with more objectivity. He even drew the inside of the dome with correct perspective, which is incredibly difficult to do. If we look at visual illusions, they reveal how we mis-perceive the world. The devil's triangle appears to be an impossible shape because of the way that we perceive 3D cues. The Shepard's table illusion shows two tables that appear to be different sizes but are, in fact, the same. People with autism are fooled less by this illusion that people without. A lot of time and effort has gone into finding out what is "wrong" with autistic people and trying to "fix" them. However, they also have strengths. We should be looking to build on them and help them achieve their potential.